Fairgrieve Elementary School students excelled during the second marking period and their effort was recognized during a recent Morning Express program. Fairgrieve Elementary School teacher Todd Terpening (back left) congratulates the recipients of the second quarter Principal’s Award. 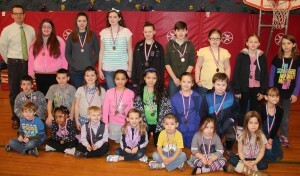 The students are all smiles as they pose with their medals honoring them for their hard work. 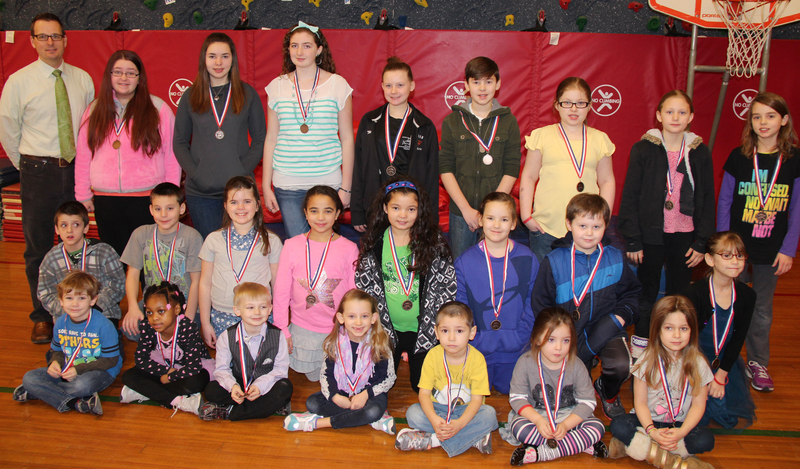 Twenty-four students from kindergarten through sixth grade earned the Principal’s Award, which recognizes students for exhibiting the school’s behavioral expectations. The expectations are part of the district-wide PBIS (Positive Behavior Interventions and Supports) initiative and encourage students to be respectful, responsible, safe and problem solvers. Emily Ilacqua, Aden Bentley and Kayla Pero (kindergarten); Timothy Van Antwerp, Casandra Guillaume, Jade Barnwell and Benjamin Renfrew (first grade); Izaiah VanBuren, Adelaide McEachen, Trevor Chappell and Gianna Tucker (second grade); Rylee Spencer, Ciara Dillingham and Alexa Halstead (third grade); Cameron Brown, Trae Mitchell, Aurora Lawton and Caitlin Todt (fourth grade); Eva Lynn Dickens, Abigail Hinman and Charlie Stoutenger (fifth grade); and Brandi Carr, Sennayeawauss Clinard and Autumn Stoltz (sixth grade).